Coming after a great Best of VMworld award and other accolades for Veeam Backup & Replication v5, it’s good to see that our free products are getting some awards as well. David Davis from Train Signal along with Kendrick Coleman from Acadia did a popular session (MA8339 “10 Best Free Tools for vSphere Management”) at VMworld 2010 in both San Francisco and Copenhagen. To coincide with these sessions, David Davis setup a poll on his site VMwareVideos.com to ask the community what their favorite free vSphere tools were. The results of this poll were announced on November 16, 2010 during a vChat episode that I was asked to be part of. Below I have posted the graph showing the top 10 but notice that Veeam took the top 3 spots. Also, Veeam was the only vendor to score over 8, pretty impressive! 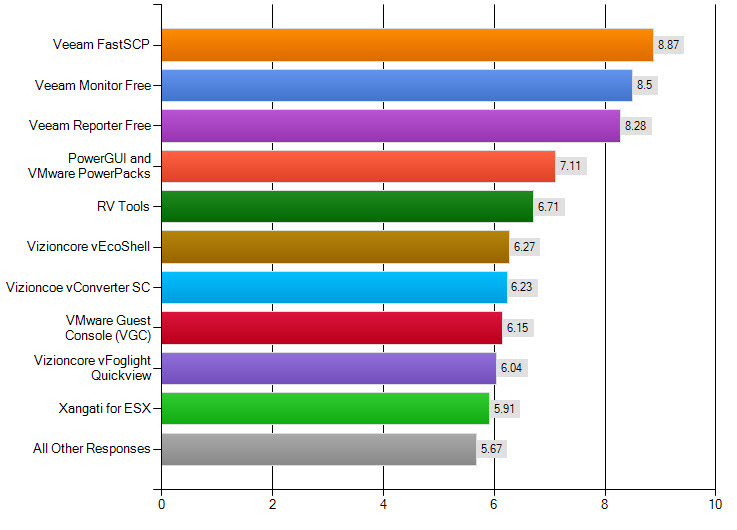 Veeam FastSCP continues to be the most popular free vSphere tool as chosen by the community. Of course Veeam Monitor Free Edition and Veeam Reporter Free Edition also did extremely well. Thanks to everyone who voted!